For months, my colleague, Dr. Oliver Owen and I have been working on some forecasting of Nigeria 2015 elections based on 2011 dynamics. The draft findings were recently posted on African Arguments HERE. I am re-posting it below. We welcome all comments, suggestions, critiques etc as we continue to refine our understanding of this rapidly changing and complex situation. In 2015’s elections half of the State Governors will have completed their maximum two terms, so state-level elections are likely to be extremely competitive across the country. However, this run-off outcome is likely to be determined by the choice of candidates put up by the main APC opposition party and the issue of North-South ‘zoning’. Nigeria’s elections conform to a rule of thumb, (as propounded by political scientists such as Nic Cheeseman) about elections in Africa and more widely: when incumbents run for re-election, they win over 85% of the time and typically with over 60% of the vote – in 2011, 17 of Nigeria’s 20 then-incumbent State Governors got re-elected – exactly 85%, with an average winning vote of 69%. Any candidate contesting for a ‘vacant’ Governorship is more likely to win, and by a larger margin, if they are from the same party as the previous incumbent. (See calculations below). As well as pointing to the importance of incumbency, and the role of constitutional mechanisms such as term limits in maintaining democracy, these results also offer a way to predicting possible outcomes of 2015’s polls. In what follows, we explore what the figures may tell us. We are aware of two weaknesses in our methodology. One is the small size of the data sample – drawn from just one previous national election under the same conditions. The other is our assumptions – for 2011’s data to have predictive value, a number of conditions must remain the same; we debate whether or not they are likely to in the section on ‘assumptions’. The first thing to note is that the alignment of political forces today is very different to 2011. Whereas the PDP went into the 2011 elections controlling 27 state governments, currently it controls 20 and can rely on the likely support of two more Governors, from Ondo (Labour) and Anambra (APGA), making 22 total. 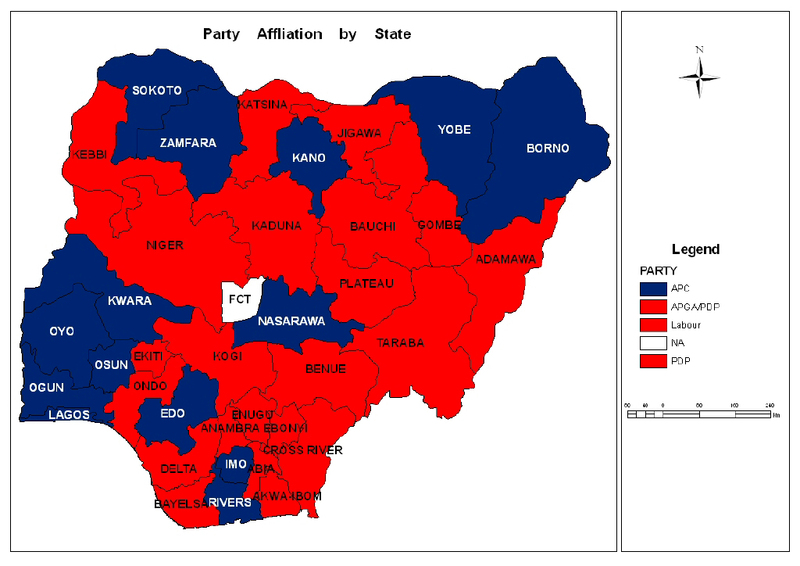 The APC opposition meanwhile controls 14 states, as illustrated below. This is a rapidly changing dynamic however, as alliances continue to be built and reconfigured. Secondly, 20 Governors entered the 2011 elections in the strong position of first-term incumbents looking to come back; but in 2015, only 10 of 28 Gubernatorial incumbents will be re-contesting – 7 for APC and 3 for PDP. The other 18 races will be ‘open’ with no incumbent, while 8 states where elections are held at different times will not be holding Governorship polls. This means more elections will be competitive, with fewer places where an incumbent Governor can be sure to ‘deliver’ a state’s vote for their Presidential candidate. This makes results even less predictable, but as 2011 shows that even outgoing parties without an incumbent recontesting retain a marginal advantage, we can assume that states which have been run by a particular party will still be more likely to support that party’s Presidential candidate. There will be elections in 2015: We work on the assumption that any attempt to delay these could lead to a major constitutional crisis and radically alter political alignments. It is possible that the Independent National Electoral Commission (INEC) could choose not to hold elections in states where the security situation prevents it; they are legally entitled to do so. Currently, three states (Borno, Yobe and Adamawa) in the North-East are under State of Emergency, although Yobe’s successful by-elections show that elections are not necessarily impossible under such conditions. Still, if elections were not held, it would not alter the conditions which we note as likely leading to a Presidential run-off. The PDP candidate will be President Goodluck Jonathan, whereas the APC would likely select a Northern Muslim candidate: This is a fundamental assumption, and we can question whether voting patterns would still cleave to 2011’s alignments if the APC candidate was for instance from the South-West, or were a Northern Christian. Equally, there is the more remote possibility that the PDP may choose a different Presidential candidate and this would also make a difference. Money is hugely important in politics, but is of limited use without genuine support. Paid-for support is expensive and unreliable, while dedicated support is more consistent (and cheaper). So while incumbents may have more to spend, they may not necessarily have more to offer in mobilising voter enthusiasm. For 2015, parties have so far made little effort to formulate policy messages, and membership structures vary from very weak to strong between parties across the country. While the PDP has struggled to convince the electorate of its ability to deliver on key issues such as poverty reduction, security or combatting corruption, the APC’s positioning as a more progressive party has been watered-down by the large number of floor-crossers the party has incorporated and its tactic of negative campaigning has also alienated some potential supporters. So it will be interesting to see to what extent both parties are willing or able to mobilise voters with policy messages rather than simply appeals to identity politics. If you’re contesting for an ‘empty’ seat, you’re likely to win by a larger share of the vote (62%) if you’re from the party which was just in power than if you’re from an opposition party (51%). If the rule that incumbents win 85% of the time with a 60% share of votes holds, for the 10 states with incumbents running for re-elections in the governorship elections, a likely outcome is that the APC wins 6 seats while the PDP wins 4. 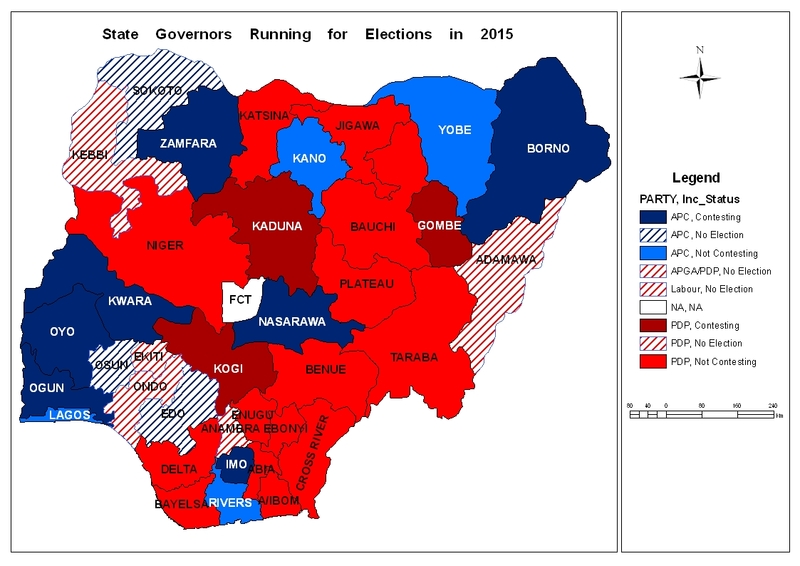 If however we go by the projected trends in the governorship elections as useful pointers, we end up with a different result, with both parties winning in 17 states each. The large number of vacant seats (18 of 28 up for election) will test the cohesion and organisation of the parties. One possibility is that the incentive for an outgoing or ‘lame duck’ Governor in a state with strong presence of an opposition party to “deliver” that state to their presidential candidate is highly variable. The analysis is fairly scientific. It is however important to note that no previous incumbent federal govt is coming with a baggage of disadvantages as this one. Natural PDP supporters are likely to vote in two ways for the 2 days set of elections. zainabusman posted: “For months, my colleague, Dr. Oliver Owen and I have been working on some forecasting of Nigeria 2015 elections based on 2011 dynamics. The draft findings were recently posted on African Arguments HERE. I am re-posting it below.